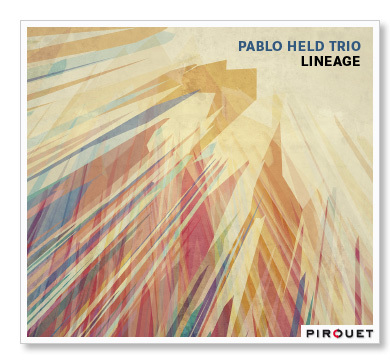 Lineage is Pablo Held’s eighth release in nine years with his trio for Pirouet Records. The pianist, not yet thirty, like compatriot Michael Wollny studied at the Conservatory in Cologne with John Taylor and has rapidly established himself on the European scene with a distinctive sound and extraordinarily empathic trio. The eight originals on this dense, often abstract but compelling and frequently propulsive set, exploit the mutual understanding between Held, drummer Jonas Burgwinkel and bassist Robert Landfermann to the full. “I like it when you don’t know exactly what is going on” Held is quoted as saying. Long, twisting, time shifting, written passages sound like they could have been improvised but for the locked left hand of the pianist and bass and stop start changes of mood and pace; instinctive hook-ups between bass, drums and piano in the midst of tumbling, mazy blizzards of notes could almost have been scripted. The distinction between composition, improvisation, familiar elements of structure and completely fluid interchange are all deliberately blurred. The opener Hidden has all these elements with the sinuous, stop-start theme flowing, punctuated by an engagingly melodic riff before dissolving into an urgent scramble of improvisation. Lament despite its title and initial dark abstraction, develops into a three-way conversation that suddenly bursts with urgent momentum before fading away. Song Noir is an angular, dark, tone poem that develops into cycling dissonant chords whilst Burgwinkel churns and lashes. Ammedea’s snappily percussive groove underpinning another angular line, gives way to a dazzling display from Held, fragmentary phrases, and glittering runs coalescing to leave an impression of something familiar but not quite stated. The more meditative title track Lineage and Spuren both hint at a theme, that of all the various elements that have, through the chemistry of Held’s composition and the bands interplay, produced their unique sound. At times an almost stated melody and moving chords leave a shimmer of Debussy in the air, at others a burst of cymbal and skittering runs from the piano hint at fiery post-bop. This is very personal and alluring music with compelling performances all round that repays close listening.